Honey bees on the brain! Posted: Thu Mar 27, 2014 1:58 pm Post subject: Honey bees on the brain! You known that honeycomb is occupying neural space when a trip to a big box garden center results in time spent bee watching. 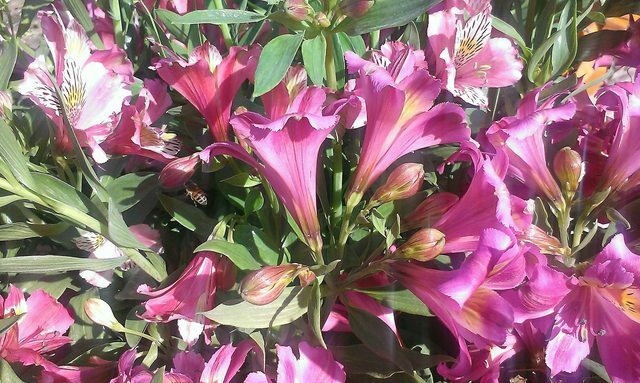 I couldn't help it -- I found myself looking for where the bees were, and the biggest cache was in a pallet of alstroemerias, which according to moraybeedinosaurs is a good source of both nectar and pollen. Took several pictures with my phone, and one actually turned out quite nicely -- see the bee, just to the left of center?